A wise Grinch once observed that the greatest gifts come outside of packages, boxes, and bags—and that’s the truth! The best gifts you give are your time and your love, neither of which can be caught and wrapped. But a tangible gift is an attempt at expressing your feelings, and once you’ve put your heart into planning, saving for, and preparing special presents, you want to make sure they draw the attention of the intended recipients. You need something unique and heartfelt for the special people in your life. How do you achieve that? Pull out your stamps and inks, of course! What better presentation can there be than one of handmade love? Stamp it. 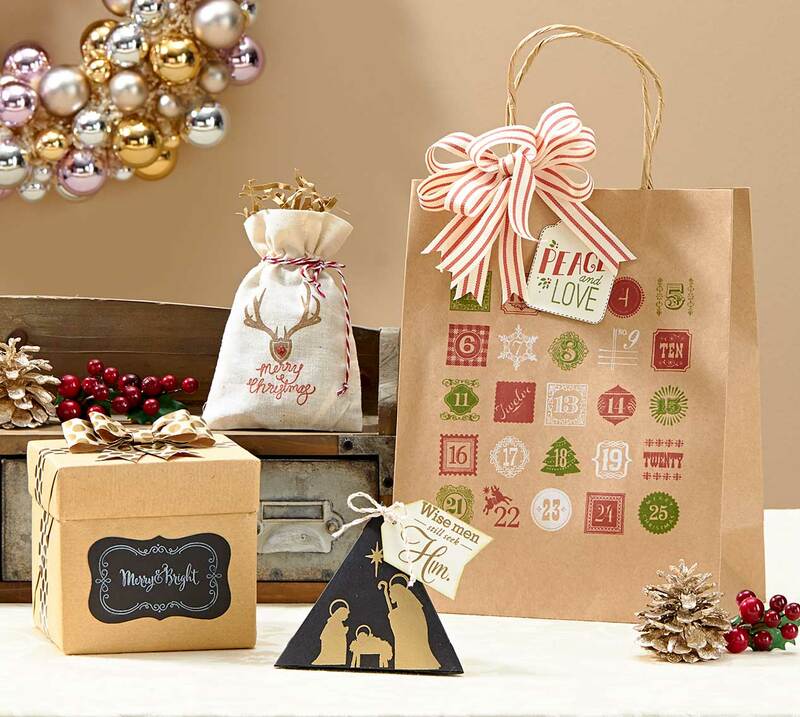 Add elegance to your brown paper-wrapped gifts with a few stamps! Dancing images on a neutral surface will give wrapping color and class. This advent bag was decorated with the My Acrylix® Magical Days stamp set in Topiary, Cranberry, and White Daisy inks. You can even add stamping to plain tissue paper for a colorful addition. Put a bow on it. Bows from the store are a dime a dozen—and they look it, too! So get creative with yours. Back your washi tape with paper and then shape it into a bow. With the help of a little Liquid Glass, the entire piece stays put. Or, for a bolder look, loop some Cranberry striped twill ribbon into a plump bow to top off your gift. Tag it. Tags are not an afterthought—they’re your chance at saying it just how you mean it. Don’t depend on a store-bought sentiment to do the trick. 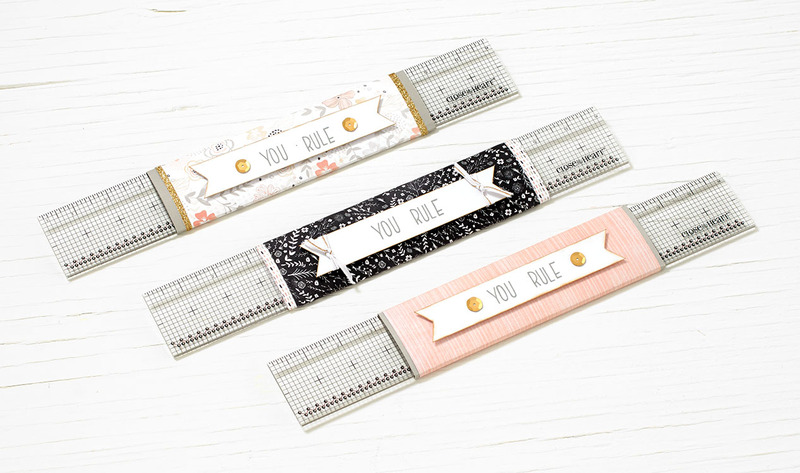 Cut a fitting tag from the Cricut® Art Philosophy or Artiste collection, then stamp it with a fitting heartfelt sentiment. Add hand drawn borders for a cozy touch. Transform it. A box shape is what they expect, so step away from traditional and draw some attention. 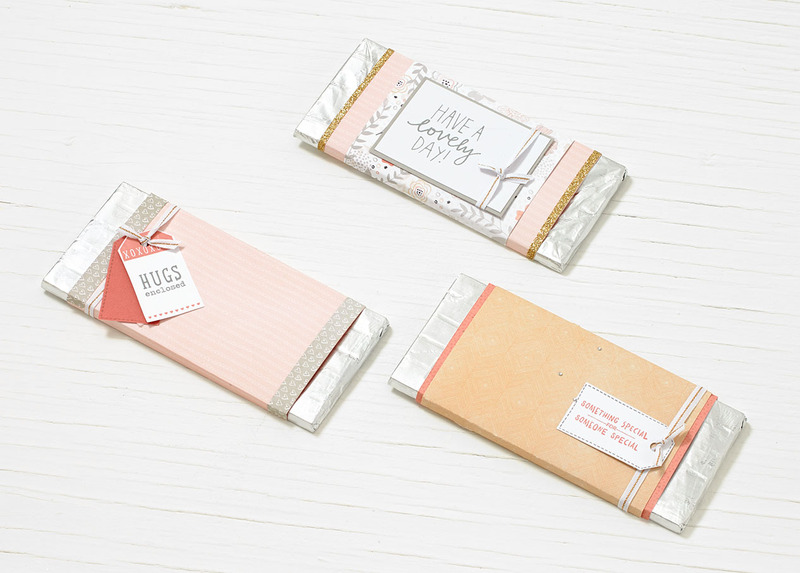 Small gifts are especially conducive to unique packaging. A My Creations™ muslin drawstring bag makes an excellent home for smaller items, and it is 100% ready for decoration. You can stamp on the bag without the ink running, and your sentiments will stand out nicely on the neutral background. It’s unpretentious and very attractive. (Such a good combination should go down in history.) Another great option: the triangle box! Cut one from the Cricut® Artiste cartridge, then add golden embossed stamping for a truly unique presentation. The wrapping you use shouldn’t come from a store; let the wrapping you use mean a little bit more! We wish you a very merry time playing with your favorite Close To My Heart products to create new and charming ways to present your treasures.